Safer, More Cost-effective, and Incredibly Flexible! Beyond hosted servers and applications, Infradapt offers a fully-managed, private cloud infrastructure solution. Featuring isolated server space, private network facilities, and secure connectivity, your entire network can exist securely within Infradapt’s hosted cloud platform. Private Network – All data for your organization exists within an encrypted and isolated network behind carrier-grade firewall equipment. It is not directly exposed to the Internet or any other Infradapt customer. Secure Access Transport – Access to your organization’s hosted server infrastructure can be established using industry-standard firewall software, point-to-point VPN hardware, or via secure MPLS connectivity. Server and Storage Resources – Every server your organization uses in production can be hosted within Infradapt’s managed services platform. Microsoft Windows Server, Linux, AIX, and many other environments are supported. High-Availability and Replication – Total platform replication is available for true business continuity to another Infradapt data center or one of your locations. Business Continuity in the Cloud – Leveraging the on-demand power of Infradapt’s cloud infrastructure allows your organization to maintain a virtual replica of your entire physical network infrastructure ready to be activated at a moment’s notice. Infradapt’s solutions start with simple off-site data replication and scale to whatever level of complexity your organization requires—up to a full replica of your premise infrastructure. 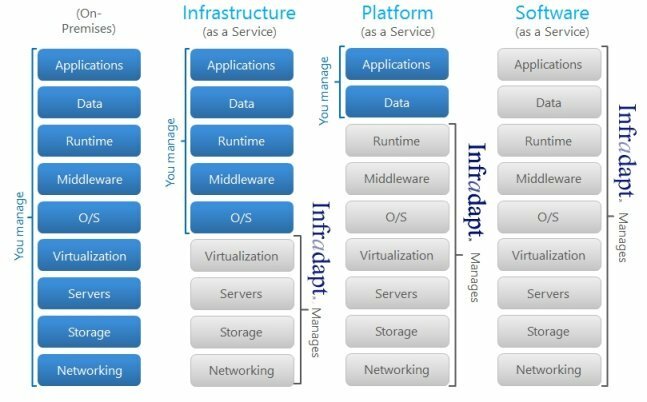 In addition to being available when needed, Infradapt’s cloud infrastructure offers superior performance to many on-premise platforms. In fact, due to the superior network performance and scalability, many customers have chosen to embrace the cloud platform as their production infrastructure and to re-deploy premise resources for backup or staging applications. Infradapt has been a pioneer in the emerging hosted voice platform market, leveraging the flexibility of its cloud computing platform to deliver efficiency to PBX and contact center services. VoIP and technologies like virtualization have helped to make cloud-based voice services reliable, efficient, flexible, and extremely cost-effective. Say goodbye to inflexible “one-size-fits-all” hosting solutions and expensive on-site equipment. 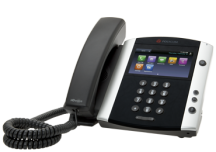 Infradapt’s hosted phone system solution offers all the flexibility your business needs. Solutions for enterprises range from hybrid on-site and hosted solutions to fully-hosted deployments for disparately dispersed enterprises. Centralized IP trunking allows your organization to gain real-time control over call routing and save money over traditional carriers. Whether dealing with an acquisition, divestiture, facility move, or other platform-affecting situation, Infradapt has both the expertise and the capacity to get the job done. With Infradapt’s cloud infrastructure solution, normal hardware procurement lead times are eliminated and the time it takes to deploy new servers is reduced from days and weeks to hours. When dealing with an unexpected surge in demand, this can mean the difference between realized revenue and lost opportunity. 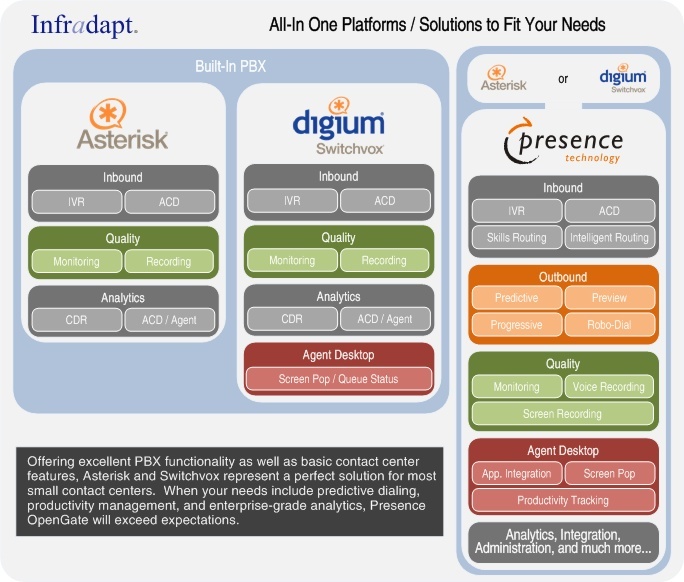 Infradapt offers a full range of contact center solutions—from Asterisk and Switchvox to Presence OpenGate—on-demand from its resilient cloud hosting platform. Whether you’re looking for a fully outsourced solution including telecommunications services or a hybrid model where you leverage existing in-house equipment, Infradapt can help you make an informed decision and get you started quickly. A hosted solution offers many advantages over on-premises equipment, including built-in redundancy and expertise, reduced initial investment, faster go-live, and other benefits. InfraCloud Cloud-based infrastructure solutions offer significantly lower start-up costs than traditional platforms, as well as quicker activation and accelerated time to market we will get you up and running fast, with the exact infrastructure you need to succeed. 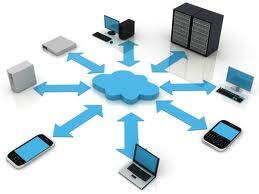 Infradapt offers complete cloud-based solutions, voice, data, contact center and support, all for a fixed monthly price. 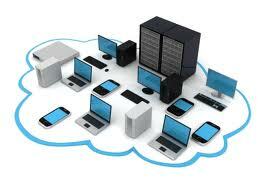 Hosted Turn-Key Small Business Platform, all you need Voice, Data and Managed Services. Available as a one-stop turn-key solution, Infradapt offers a total infrastructure solution for small business. From file storage, virtual desktops, and Microsoft Office, the Turn-Key Small Business Platform also includes e-mail and phone service. We migrate your environment from a premise-based situation to a cloud-based environment and run your workloads in the cloud. Whether your workload is voice, data or both, we have the experience and the expertise to make the transition seamless and as easy as 1, 2, 3. If you are looking for the next generation operating system from Microsoft with the added peace of mind of knowing it was done to your specifications, Infradapt’s hosted Windows is the solution. Exchange fully hosted and replicated. Nothing is more mission critical than communication. E-mail and telephony are at the heart of today’s enterprises. Your business deserves and needs the same reliability and features that Fortune 100 companies rely on. Infradapt hosted e-mail and communication solutions give you just that – a Fortune 100 solution on a Small Business budget. Many ERP solutions today run on SQL databases. If you face the challenge of looking for a solution that will allow your entire company to gain access to the same data, all of the time, regardless of location – talk to us about how to host your ERP Software and/or your Application Databases. Asterisk is the most widely used Open Source PBX software in the world surpassing the number of installations of traditional vendors of proprietary IP Telephony such as Cisco, Nortel and Avaya. LAMP (Linux, Apache, MySQL, Php, Perl, Python) is the open source base for many world class web enabled applications. Learn more about Turn-Key Small Business Platform. 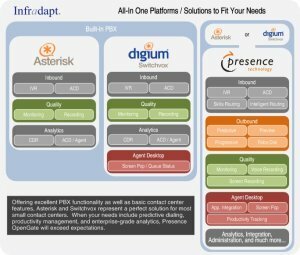 Infradapt offers a full range of contact center solutions—from Asterisk and Switchvox to Presence OpenGate—on-demand from its resilient cloud hosting platform. Whether you’re looking for a fully outsourced solution including telecommunications services or a hybrid model where you leverage existing in-house equipment, Infradapt can help you make an informed decision and quickly get you started. Infradapt’s hosted platform solutions are monitored for high-availability 24/7 and designed to be highly resilient. All hosted solutions include full access to Infradapt’s 24-hour help desk and operations center so you will never have to worry about where to get help when you need it.